Nissan Performance is building a 370Z for the track. They are to the point where they are asking for votes on the braking system. There is only one choice : AP Racing. Head over to the page and vote for some of the best brakes in the world- AP Racing. Project 370Z: The powertrain, exhaust, and suspension have already been chosen. Now it’s time to select brakes that will stop this Z on a dime. 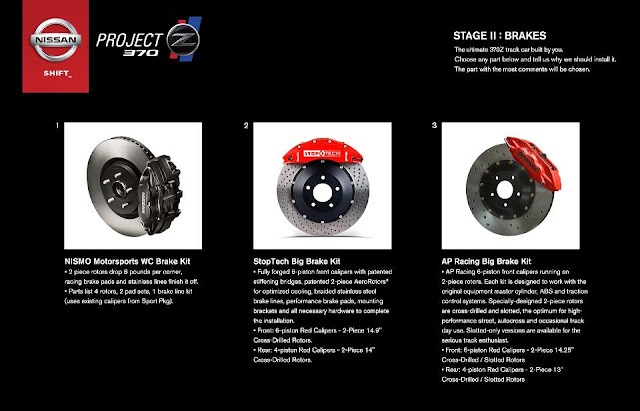 Please carefully review and pick your favorite option: NISMO Motorsports WC Brake Kit, StopTech BBK or AP Racing BBK.